This impassive attitude stems from the fact that I have almost zero knowledge of French history, and what I do know comes from other references. I know when they were friends and when they were enemies with the English, because that's within my wheelhouse of English history. I know about the excellence of French cuisine thanks to the Food Network, and I am aware of some of the famous bars because that's where all my favorite expat authors hung out in the early 1900's. Other than that, I've got zilch. Therefore, it's difficult to see a building or a landmark and grasp its significance. In someone else's eyes it's living history, but in mind it's just brick and mortar. So with that, my update on our Paris trip is going to be short and sweet. It was a one and done deal for me, an opportunity to say I went and another place to mark off on my kid's traveling portfolio. Alex and I made arrangements to visit the city during our Disneyland Paris trip. We didn't want to drive ourselves, and since we got free parking while staying at the resort, it made sense to work it into our vacation. The French rail strikes were happening during our time in France, so I chose our visitation day based on when the trains would be running at full capacity. The kids woke up at 5:15 a.m. the morning of our excursion; Alex and I don't know why since they had spent the evening before riding rides in the park. However, we decided to roll with it and got ourselves ready for an early morning. For anyone who isn't aware, there is a train station next to the Disney Village, which we were able to access thanks to a security guard who let us through a shortcut. There were ticket kiosks right inside the entrance where Alex was able to buy a day pass for all of us that gave us unlimited access to the RER lines and the metro. None of the machines wanted to read our credit card, so it was lucky we had enough cash on hand to pay for the passes. The train ride from Disneyland Paris to the city center lasted a little over an hour and wasn't too crowded. It mostly consisted of men and women going to work, which is logical. There weren't too many other tourists who were crazy enough to start their sightseeing at 6 in the morning. We switched to the metro line at some point, but all the signs were easy to read and we didn't have any issues the entire day. Like the Underground system in London, so long as you follow the maps and pay attention to the stops you shouldn't get turned around. Our first stop of the day took us to the Arc de Triomphe. Alex and I knew it would be large, but it was much bigger than we imagined. Even a French novice like me was impressed by its size and grandeur. Next up, was the one and only Eiffel Tower. Just because this wasn't high on my priority list didn't mean I didn't do some research beforehand. In my readings, I learned that the best place to view the Tower in its entirety is from the Parc de Trocadero. This information turned out to be spot on, and since we arrived at 7:00 a.m. the open plaza was practically deserted. We shared the view with a model photographing a wedding gown and a tour group. Even the peddlers were only just arriving and setting up their wares. It was a special experience and one that we all appreciated. 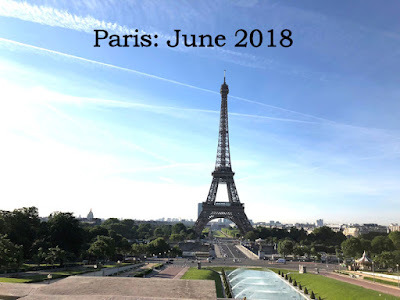 During our breakfast, Landon asked if we could go look at the Eiffel Tower again, so we went back to the same spot and watched as the crowds grew thicker and thicker. It was amazing what an hour's difference could make in the place. If you want an unobstructed view of the area, you really need to get there at sunrise before the city wakes. Our final stop was at the famous Louvre Museum. It was in the plaza that Landon had a meltdown and cried for a good ten minutes. He didn't want to get on a train and go back to our room nor did he want to go inside the museum. I tried every trick in the book to get him to cooperate but nothing was sticking. Eventually, I had to think like a 5 year old boy and come up with a game to get him to go inside the museum. Ladies and gentlemen, I'm not proud of this, but the way I got Landon to settle down was by starting a contest. Whoever counted the most "booties" in the artwork got a piece of chocolate. Yes, you read that right. I took priceless paintings and sculptures and turned them into a schoolyard game. But I was willing to do anything to get us inside. We were so close, it would have been a shame to have to turn and leave at that point. We made it through the security checkpoint and to the ticket window in no time. It was only 9:30 in the morning so the congestion hadn't built yet and there was no need for an advanced reservation. In addition to our entry tickets, I also bought an audio guide but it ended up in Landon's hand for most of the trip. The guide was on a Nintendo 3DS, and Landon got a kick out of hunting down numbers next to the bigger pieces and typing it into the device so he could listen to a brief description. Alex also picked up a rental stroller for free! We had to leave a photo I.D. at the desk as collateral, but we got it back when we returned the stroller. Both this and the guide were convenient items to have; each kept the kids occupied longer than normal. It allowed Alex and me to spent two full hours in the museum. Upon exiting the Louvre, Alex and I walked a few streets over and found a little hole in the wall patisserie that had a line out the door. The selections in the window looked and smelled delicious, so we decided to get in line and pick a couple snack items. Between the four of us we split two eclairs, and they were just as good as we hoped them to be. The food in Paris was such a pleasant surprise. I was delighted to discover something I wasn't expecting on my trip: one of the best snacking experiences I've had in Europe. After our treats were finished, the four of us walked to the closest metro station and made our journey back to Disneyland Paris. We were back in our room by two in the afternoon! It was a busy but enjoyable day, and I think the number one thing that I took away from the experience was that Paris was exactly as I imagined it to be. Every movie, book, song, poem, etc captures Paris to a tee. The sounds of traffic, the cold bricks of old walls, the romantic feel in the air was just what I pictured in my head. The uniqueness of the city comes through in modern works and it was fun to see that for myself. Paris carries itself as no other place does. Paris is not my favorite. It’s ruined by the dirt, and opportunists. The architecture and especially the food are almost enough to redeem it. I do like Strasbourg. You should go sometime.